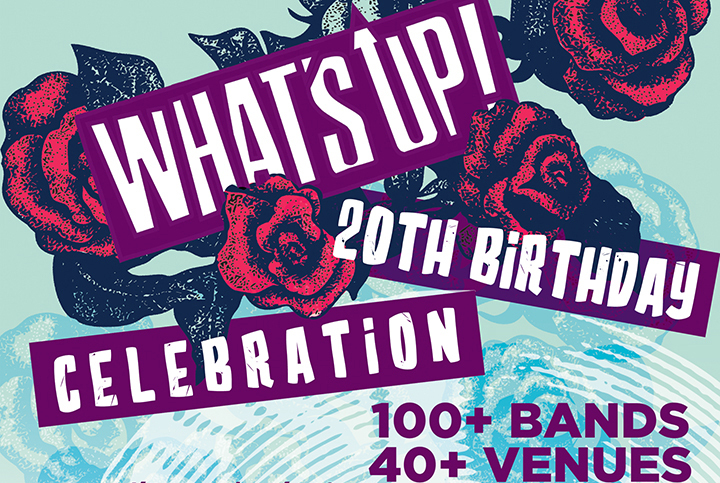 What’s Up!’s 20th Birthday: 100+ bands, 40+ venues, March 2-3! What’s Up! is celebrating 20 YEARS in March 2018! 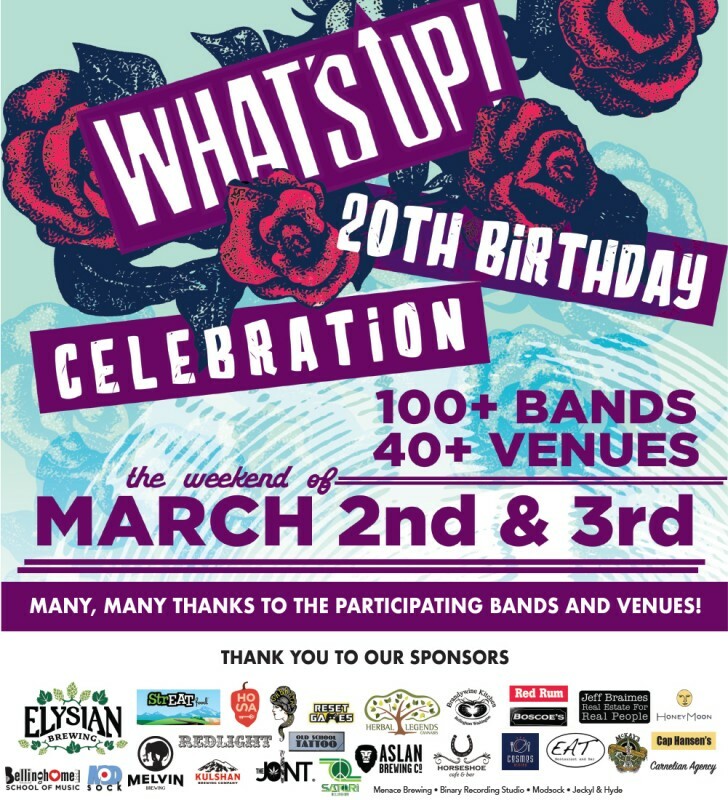 We are hosting a music festival on Friday and Saturday, March 2-3, with 40+ venues and 100+ bands turning downtown Bellingham into a live music explosion. This will be the biggest festival in downtown history. Local bands, including some favorites from days gone by, will be playing throughout downtown in music venues, coffee shops, record stores, restaurants and everything in between. All shows are free, in the exception of a handful of shows featuring reunited bands. 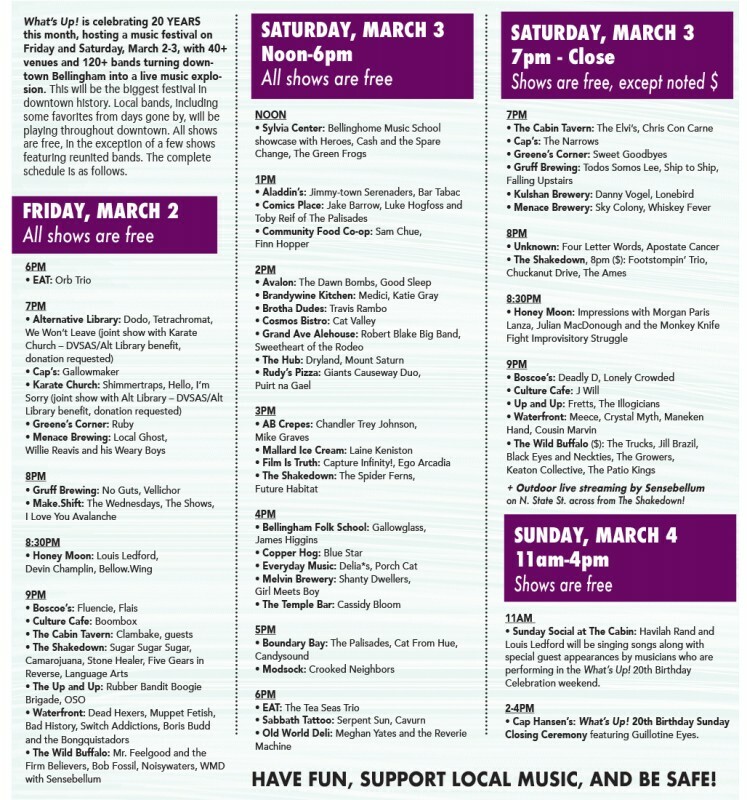 Saturday, March 3 • AFTERNOON, all shows are FREE! • Sunday Social at The Cabin, 11am: Havilah Rand and Louis Ledford will be singing songs along with special guest appearances by musicians who are performing in the What’s Up! 20th Birthday Celebration weekend. • What’s Up! 20th Birthday Sunday Closing Ceremony, 2-4pm: Featuring Guillotine Eyes at Cap Hansen’s. HUGE thanks to our sponsors: Elysian Brewery, Melvin Brewery, Aslan Brewery, Boundary Bay Brewery, The Joint, Herbal Legends, Cap Hansen’s, Red Rum, Bellinghome Music School, Boscoe’s, Brandywine, Carnelian Agency, Honeymoon, HOSAco, Jeff Braimes, The Redlight, Sabbath Tattoo, Streat Food, Cosmos Bistro, EAT Restaurant and Bar, Horseshoe Cafe, McKays Taphouse, Binary Recording Studio, Old School Tattoo, Satori, Kulshan Brewery, Menace Brewing, Modsock, Alice Clark, and Jeckyl & Hyde. Thanks for joining us and we look forward to celebrating with you! Remember to have fun and be safe!